As the name suggests, Dayara Bugyal is one of the most picturesque grazing grounds in Uttarakhand. In Winter it gets covered in snow and offers a magical experience to all. On previous night leave Delhi for an overnight journey to Raithal. The route trails through the scenic towns of Rishikesh, Chamba and Uttarkashi beside the Bhagirathi River. On arriving at Raithal that stands tall at 7,545 ft, will have lunch there. The trek leader will brief you about the dos and don’ts of the trek and from here we will go for warm-up trek of 1.5 kms to base camp for Dayara Bugyal. After breakfast we will start our trek to Dayara Bugyal via Barnala. This 8 KM long trek is normal ascend till Barnala and is landscaped beautifully laced with Rhododendrons, Silver Oak and Deaodar forests. Pass through Barnala which is at an elevation of 8,530 ft. It is this place which marks the beginning of the green meadows or ‘Bugyals’. As you end the ascend at Dayara, the vast meadow unfolds in front of you. The meadow is like a table top as you set foot on the meadow the sight of the mighty Himalayas surrounds you. Set up your campsite at this ideal location and retire here for the night. Wake up to a 360 degree panoramic view of the entire greater Himalayas and enjoy warm breakfast. 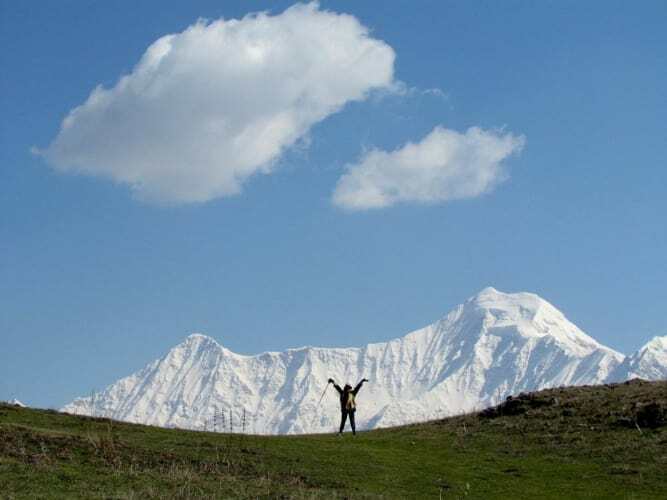 We spend some time around Dayara Bugyal and enjoy the vast meadows. Post this we start the journey down hill to Goi lake, a beautiful lake surrounded by Goi meadow. After this we start for Raithal and begin our return journey to Delhi by evening. 300 per day Porter / mule charges for carrying your backpacks. Any cost which is not mentioned in the “inclusions” or is personal in nature.